The staggered arrangement of the 4 openings for Pouring Zyklon-B is valid only for Krematorium III, where the undresssing room would have been located top right. There are many faults in this model. Insufficient supporting pillars, only 1 out of 7 being shown. Second Zyklon-B introduction column missing. 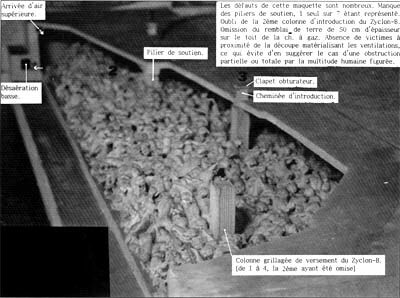 Omission of the 50 cm layer of earth over the roof of the gas chamber. Absence of victims in the vicinity of the cut-out representing the ventilation opening, which avoids suggesting the case of partial or total obstruction by the human mass depicted. Despite its imperfections, the model, seen from a distance is a powerful evocation of a mass gassing.